Cleaning and sealing stamped concrete requires a commercial grade pressure washer and an experienced craftsmen to install the concrete sealer that is required to use with your decorative concrete. Give us a call for a free estimate for your next reseal stamped concrete project. There are conditions where plainly the most exceptional product is concrete in regards to strength and toughness but is not preferred due to its appearance. A walkway made from concrete can be smooth, exempt to buckling or separation as cobblestones might be, however far less attractive than a stone pathway. Stamped concrete enables the homeowner to have the gorgeous sidewalk they desire but likewise have the strength of concrete to make it last. ​Concrete that has been stamped has actually been around a long period of time. It is just just recently that advances in coloration and texture imprinting have actually made it genuinely a viable option for the critical owner and contractor. In the past it was a less than acceptable option used by those who just needed to have actually concrete instead of other products and it was fairly clearly aesthetically substandard. ​Today concrete that has actually been textured and colored is still concrete with all its strengths however it also is much more kindly to the eye. This product is beginning to be typical not only in businesses but in high end houses. While a stamped concrete walkway might look much like another product such as natural stone or cobble stones it has few of the same weaknesses of this material which make regular repair services essential. ​The stamping process for concrete isn't a simple do it yourself project. It needs customized equipment and ability and is a multistage affair. While pouring concrete is fairly straight forward and practically any individual can do it, the stamping and structure impression process is almost always strictly a job for the proficient expert. ​With this procedure, concrete is poured as usual but in a very thick layer more than 4 inches. Colors are often contributed to concrete in the mixer, if not then they are used after the concrete is poured. A release representative is put on the surface of poured concrete, this will permit the structure mats to positioned on the concrete pleased and then release without removing the concrete. ​When the concrete dries for about 1 Day the release agent should be cleaned off the surface area. After the concrete dries a clear sealant is applied to preserve the color and structure of the stamping. This may look like a really complicated process and it is, but when toughness is a must but looks are likewise desired there is no replacement or competitors for this type of concrete. ​While colored and textured concrete can not contend in terms of appearances with the real thing such as cobblestones or flagstones it has undeniable benefits. This old product has a interesting and fresh new look thanks to some terrific advances in recent times. Often improvements in old products are as interesting as brand new materials. ​Stamped concrete is an old material, concrete with an excellent new look which makes it far more attractive for many uses today. 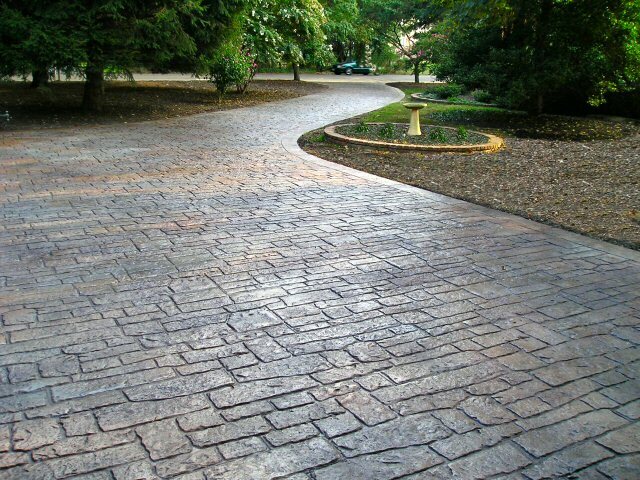 Stamped concrete allows the property owner to have the beautiful sidewalk they want but likewise have the strength of concrete to make it last. ​Today concrete that has actually been textured and colored is still concrete with all its strengths however it likewise is much more pleasing to the eye. Colors are often included to concrete in the mixer, if not then they are used after the concrete is poured. A release agent is applied to the surface of poured concrete, this will enable the texture mats to positioned on the concrete pleased and then release without eliminating the concrete.